Are you wishing that you could get rid of some of your lines and wrinkles? You’ve probably tried every anti-aging serum. But, those often don’t give you the kind of results that make a noticeable impact. Plastic surgery is an option, but that’s a big commitment that comes with a big price tag. What do you do if you just want to look fresh without doing anything drastic? One great option is to try an injectable filler like Restylane. Unlike anti-aging creams, you will notice the difference immediately. The results are soft and subtle. With all these benefits, it’s no wonder that getting dermal injectables have soared in popularity. Are you ready to freshen up your face and feel more confident? Read on to learn how Restylane can help turn back time. Once you enter your 20’s, your skin begins to age. Slowly but surely, it begins to lose its elasticity and plumpness. What is it that makes your face look round and youthful? One factor is Hyaluronic acid, a substance in your skin cells that adds moisture. Unfortunately, as you age, that Hyaluronic Acid begins to dissipate. Consistently protecting your skin from the sun can help slow that process, but it won’t stop it. As your moisture level decreases, so does the volume in your skin. This causes wrinkles and creates that hollow look around the cheekbones. You’ve probably noticed that Hyaluronic Acid is a common ingredient in skin care products. Using those topical creams can help add moisture to your outer layer of skin. However, it isn’t able to absorb deep enough to plump your skin and smooth out wrinkles. That’s where Restylane fillers come in. Restylane is a dermal filler made from a Hyaluronic gel. When it’s injected into your skin, it absorbs the moistures that exist in your body. The gel holds onto those water molecules, making it expand underneath your skin. This is how the naturally occurring Hyaluronic Acid once kept your face wrinkle-free and plump. Additionally, that extra moisture added underneath the skin affects its outer look and texture. Besides filling in wrinkles and sunken areas, it makes it look more supple and soft. You’re basically applying a moisturizer from the inside out. 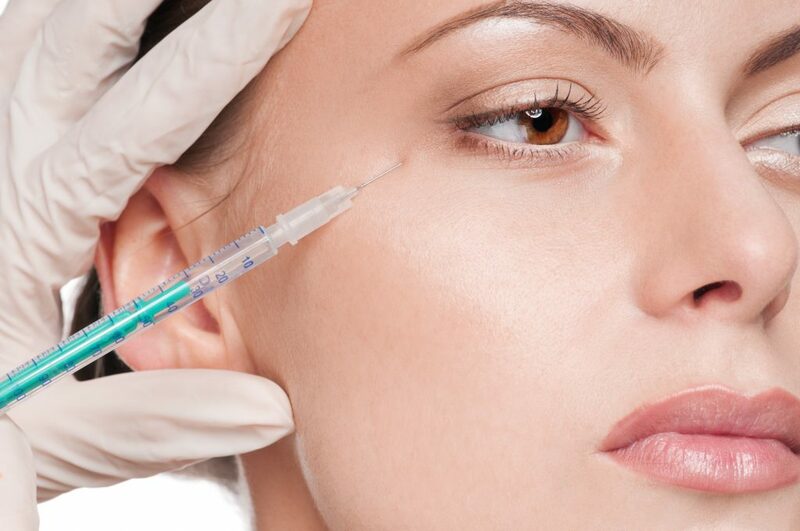 Besides Restylane, there are many other injectable anti-aging treatments available. Though they are administered the same way, many of them achieve different looks. Depending on what you’re looking for, Restylane might be the right treatment for you. Restylane is most effective on medium-set wrinkles. Laugh lines and other creases around the mouth respond well to this treatment. Other than filling in wrinkles, it works well in plumping under the eyes, and in the cheeks and lips. Even if your face looks great, one area that can betray your age is your hands. This area also loses fat over time, making them look older. Luckily, Restylane is effective in restoring the youthful volume there as well. Since Restylane just fills in wrinkles and add volume, you’ll still be able to make all the same facial expressions you did before. People who want results fast without any downtime are also prime candidates for Restylane treatments. If you go the plastic surgery route, you’ll see a big change. But the recovery involved is significant. Even more than that, for some procedures it can take months to see the final result. That’s because there’s so much swelling and it needs a long time to finally settle. There can be some tenderness, redness or bruising at the injection site. However, sometimes it’s so minimal it can be concealed with makeup. After your treatment, you’re going to love your new look. Luckily, it doesn’t require much maintenance to keep you looking fresh. Unlike getting eyelash extension refills, coloring your hair, or doing your nails, Restylane requires little maintenance. You won’t have to come in for another round of injections for 4-12 months (after you are satisfied with your correction). How often you need to come in depends on how fast your body breaks down the Hyaluronic gel. Where you had the injections done plays a role as well. The more that area moves (like your mouth when you talk) the faster it will dissipate. Lip injections last about 4-6 months. Mouth wrinkle injections are about 6 months. Eye injections have a year-long shelf life. Over time, the treatments will help your face create more collagen. That will allow you to stretch the time between treatments even further. Like any other injectable, it’s hugely important that you find a licensed and reputable professional to administer it for you. Some people might offer to inject you for cheaper than market value. Though it’s tempting, it’s too good to be true and you could be getting a knockoff product that’s unsafe. Want to freshen up your face without an invasive procedure? Trying Restylane is the way to go. It’s fast, effective, and won’t leave you bruised and swollen for months like plastic surgery. Are you ready to take the leap towards younger looking skin? Contact us to make an appointment for a no obligation consultation. For latest news and in dept articles about Dermal Fillers please visit our blog.